1) Course: Practical Deep Learning for Coders. INFO: The course v3 is currently available. It is targeting developers with at least 1 year of programming experience (ideally Python). The course consists of 7 lessons. Each class is around 2 hours long and requires around 10 hours work to complete all the assignments. 2) Virtual Apollo Guidance Computer. INFO: This project is a Virtual Machine that allows emulating the Virtual Apollo Guidance Computer (AGC). AGC specification look very interesting: under 4 kB of RAM, 69 kB of ROM. The AGC was capable of performing about 85,000 instructions per second. All at just below 32 kg (70 pounds). If you want to learn more about AGC then this video seems to be a good start. 3) A Waymo One Rider’s Experiences Highlight Autonomous Rideshare’s Shortcomings. INFO: From this article we can learn that left turns and lane merges are difficult to execute for the autonomous cars, especially when safety is your top priority. What we’ve also found interesting in the article is the fact that the safety drivers in Waymo’s cars are making voice logs that are timestamped and can be used for later improvements. 4) Clearpath Robotics ROS Cheat Sheet. INFO: If you would like to have some of the useful ROS commands accessible in one place then those cheat sheet by Clearpath Robotics can be a good starting point. The cheat sheets cover Hydro, Indigo and Kinetic ROS releases. INFO: PX4 is an open source firmware, most popular on Pixhawk autopilots. In this post the development roadmap for 2019 is discussed. Interestingly the plan is to make linux onboard computers first class citizens for PX4. This can be achieved through development of FastRTPS, which will enable native compatibility with ROS2 messaging. 6) Gatwick Airport Trial for Valet-parking Robots Aimed at Cutting Hassle for Travellers . INFO: In August a trial of Valet-parking robots is set to begin at Gatwick Airport in the UK. The robots developed by Stanley Robotics slide underneath the car and gently lifts it up by the tires and is ready to park. 7) Publication of the week - CERNTAURO: A Modular Architecture for Robotic Inspection and Telemanipulation in Harsh and Semi-Structured Environments (2018). INFO: This paper presents developments of robotics framework at CERN (European Organization for Nuclear Research). The control system is layered having layers responsible for communications, application, supervision, control and hardware abstraction, all communicating with each other using inter process communication. The paper also discusses different scenarios how the framework has been used at CERN for maintenance tasks etc. 1) Humble Book Bundle: Programming Cookbooks by O’Reilly. INFO: Do you want to brush up on your programming skills before diving into the practical deep course? Then this bundle and in particular a Python Cookbook might be for you. 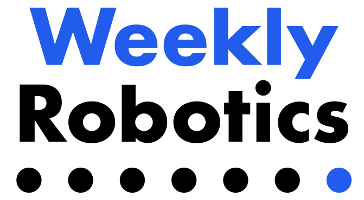 By purchasing this bundle you can support charities of your choice and Weekly Robotics. 1) Southwest Research Institute (San Antonio, TX, US) - Various Positions. INFO: Southwest Research Institute (SwRI) is one of the largest independent, non-profit, applied R&D organization in the US. The above positions are all related to development of ROS-Industrial. 2) Greenzie (Atlanta, GA, US) - Robotics Software Developer / Intern. INFO: Greenzie’s mission is to free humans from manual labor. We’re starting with the hardest tasks first - highly repetitive outdoor work in the green industry: lawn maintenance, turf mowing, landscaping. 3) Rogo (West Lafayette, IN, USA) - Lead Robotics Software Developer. INFO: Rogo builds and operates autonomous robots to help farmers get more consistent soil samples to ultimately apply their fertilizer more efficiently. 4) Parkopedia (London, UK) - Robotics Software Engineer. INFO: Parkopedia was founded with the mission of being able to answer any parking question, anywhere in the world.